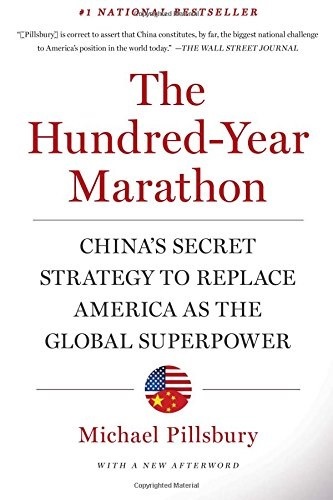 The Hundred-Year Marathon: China's Secret Strategy to Replace America as the Global Superpower by Michael Pillsbury is a close examination of the US-Chinese relationship over the last 40 or so years. Pillsbury has worked for the US as a crucial link of their relations with China for a great many years. China has always been a big player in the world’s affairs. It is no surprise then that it’s attempting to take the influence as a global superpower to the next level. Usually countries do this with extremism, such as Hitler, Hussein and so on. But that is not the way China operates, and the Chinese think differently. China has spent a good portion of the last 200 years being at the sword tip of outsiders, like the opium wars, boxer rebellion etc. China plays off these historic events to enhance its position while bargaining, especially with the US. This is especially evident on a macroeconomic scale, where the US has been relying on Chinese manufacturing for more and more things. A significant difference between western thinking and Chinese thinking is the idea of waiting. We in the west don’t like it, we like our ‘get rich fast’ schemes, and quick gains. The idea of a hundred year marathon is that China will replace the United States by the 100th anniversary of Mao’s rise to power. Slow rise to power eliminates the usual threats to the outside neighbors. In keeping with Sun Tzu’s “If you wait by the river long enough, the bodies of your enemies will float by” time is treated not as something to be overcome, but as something to be used to your advantage. China is a growing economic power and there is little doubt of its manufacturing base and rising living standards. China’s managed to take over most of the world’s manufacturing needs. Western nations gained wealth by colonizing and or outright taking of land. China plays a much softer role in terms of gaining political and economic power. China knows it needs resources to grow and has turned to Africa for many resources in what seems to be reverse colonization. To secure resources, China invests heavily in African nation’s infrastructure in return for access to strategic materials. The process is building bridges between nations instead of creating conflict. US businesses oftentimes see China as an end in itself, expanding to the huge, Chinese market being an end-goal. China sees things differently - they see the US as merely a means to an end, playing their game of waiting out their opponent until an opportunity presents itself, a small crack in their armor. Chinese businesses don’t merely overwhelm in a matter of days like Alibaba did, they also do it over years and years, generation after generation. And this is exactly what makes it such a formidable foe, and valuable ally.